I’m a strong believer in the wealth of knowledge that comes from TED talks and seminars all over the world. I have learned a great deal, and I’m still learning from these talks. 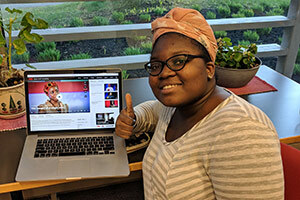 Based on the impending award of an honorary degree to Chimamanda Ngozi Adichie, I decided to watch all of her videos, TED talks especially, all over again. The first time I listened to one of her TED talks was five years ago in high school. I had just read Americanah, and I was so struck by that novel that I began to search for her speeches, talks- just anything to hear her speak and to learn from all she has to say. The infusion of a rich cultural perspective, educational enlightenment with great sense of humor makes her talks even more motivational and inspiring. In just 20 minutes in her talk, The Danger of a Single Story, I became aware of my own shortcomings. It is very easy to let one story speak for so many others, to let one thing become “the it”. I saw how I myself easily generalize and assume identities about people. I appreciate how Chimamanda is able to show, without judgements, how misunderstandings create a limited cultural perspective in a universal context. This talk has encouraged me to seek out people and their stories, to ask people their names, to try to understand their views through their eyes. I am able to see each person as a unique version of their own stories, written by them. By listening to this talk, I learn not to be a quick judge of character, but to have the ability to create healthy conversations where differences can be discussed and celebrated. Thank you. Please watch if you can. I have seen this talk. It was recommended to me by a friend, who also led me to her books. It is a wonderful talk. Thanks for reminding me of it and sharing it with us.